100 Words, 100 Days: Day 27. On Not Having Regrets. | What I think About When I Think About Writing. ← 100 Words, 100 Days: Day 26. On Insomnia. 100 Words, 100 Days: Day 27. On Not Having Regrets. Yesterday afternoon a defiant and sturdy Dublin hurling team gave as good as they got to the reigning All-Ireland Hurling champions, the Premier County, Tipperary. 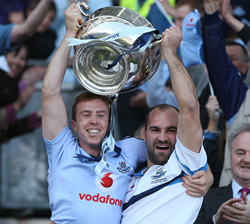 Unheralded at the start of the season, Dublin took the Nation League title, beating Tipp along the way. But the Championship is meat and drink to all GAA players. Reaching their first final since 1948, Dublin came out with all guns blazing but lost a hard-fought match by four points. They have the pleasure of looking each other in the eye in the dressing room, knowing they gave it their all. They can have no regrets. This entry was posted in 100 Days, 100 Words, Dublin, Sports and tagged All-Ireland Senior Hurling Championship, County Tipperary, Dublin GAA, Gaelic Athletic Association, Ireland, Organizations, Sports, Tipperary, Tipperary GAA. Bookmark the permalink.